The Electronic SmartDoor by PetSafe is manufactured for installation into doors that range from 1.5 to 2 inches in thickness. This door is only rated for use with dogs as the flap is too heavy for a cat to push through. 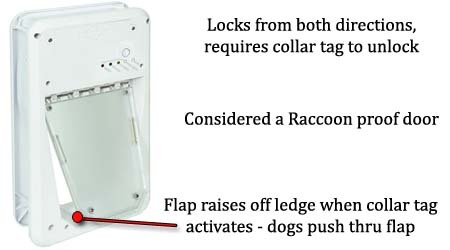 The electronic action of this door is triggered by the collar tag (Requires special PetSafe battery) and will raise up off a ledge allowing the pet to push through the flap. The flap will not move out of the way. Once the tag is out of range, the door will lower itself to the locked position. Note: The PetSafe Electronic SmartDoor is a inexpensive door that is made entirely with molded plastic parts. Customers should not expect this product to last indefinitely. The life may be shortened even more when used by larger dogs. 9 1/2" x 15 3/4"
14 7/16" x 21 15/16"